Order both Daniel and Williams 1st and latest book in one package and save $5 off the price. 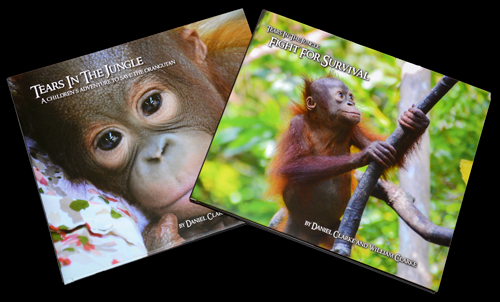 "Tears In The Jungle: Fight for Survival"
Did you miss out on Daniel and William's first Best Selling Australian Book ? No problem, just order both books and save $5 off the cost of the books. Enjoy reading Daniel and William's latest adventure into the jungle. The amazing QR Codes in Fight for Survival will allow you to watch videos of baby orangutans as well as travelling up the river through the jungle in Borneo. This book is suitable for all ages and contains no graphic images.